Wrinkles — can’t abide them, can’t really avoid them. Or can you? Although fine lines can be somewhat easy to visibly smooth out, deeper wrinkles tend to be far more troublesome and tenacious. Enter IMAGE Skincare’s the MAX Stem Cell Crème. Let’s break down exactly why this remarkable product is the best for deep wrinkles. 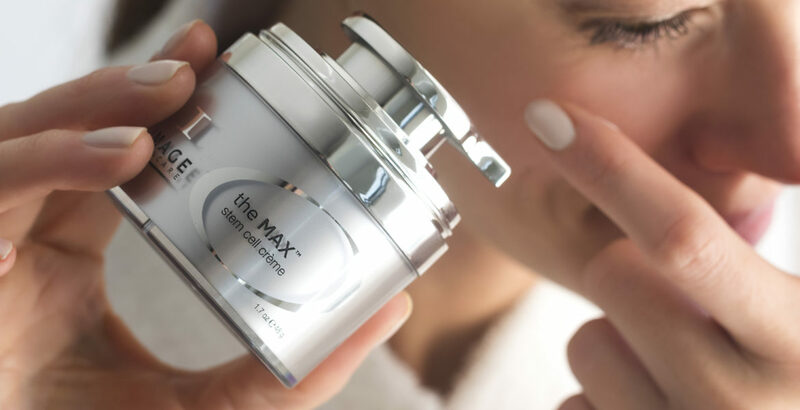 the MAX Stem Cell Crème addresses the appearance of fine lines and wrinkles by using a multi-pronged approach: an innovative delivery system and carefully selected ingredients that work in synergy to tackle the appearance of aging. Let’s delve a bit deeper. You can pack all the best ingredients into a formula but it’s no use if it doesn’t actually get delivered properly into skin. That’s where Vectorize Technology comes in. Vectorize Technology™ houses a potent mix of ingredients layered inside specialized “spheres” that slowly peel away upon application. This ensures that typically unstable ingredients are kept “safe and secure.” In other words, skin-friendly ingredients actually make a tangible impact on skin by working for longer and by protecting the ingredients as they make their journey outside of the bottle. Want to know precisely how this technology works? Read this blog post. If you’ve looked for ingredients to help with the signs of aging, you’ve likely heard of peptides. These chains of amino acids are essential building blocks of protein that play a vital role in maintaining visibly firm, supple and structured skin. As collagen (the protein responsible for taut skin) naturally depletes as we age, skin loses its elasticity—and replenishing our skin with peptides is a smart way to reinstate the look and feel of firmness. Among the peptides included in the MAX Stem Cell Crème are acetyl hexapeptide-8 (also called Argireline), palmitoyl tripeptide-38 (also known as Matrixyl), palmitoyl tripeptide-1 and acetyl octapeptide-3. These peptides have shown to soften the appearance of sagging, wrinkles and expression lines. Both acetyl-hexapeptide-8 and acetyl octapeptide-3 are credited with helping to decrease the apperance of deeper lines. But don’t worry — your face won’t be frozen solid and look unnatural—it will simply be far less likely to wrinkle due to constant movement. The palmitoyl peptides (palmitoyl tripeptide-38 and palmitoyl tripeptide-1) help with visible firmness and give skin that bounce associated with a youthful look. In one study, a cream containing palmitoyl tripeptide-1 demonstrated “reductions in wrinkle length, depth and skin roughness,” while another study showed palmitoyl tripeptide-38 helped reduce wrinkle volume. The plant-derived stem cells in the Vectorize Technology™ complex include malus domestic fruit cell culture, vigna radiata extract, leontopodium alpinum meristem cell culture and argania spinosa sprout cell culture. The names may be tongue twisters, but their importance and potency shouldn’t be skimmed over. The role of these plant-based substances is to help shield from the visible effects UV damage, such as dark spots, fine lines and sagging. For example, a potent form of vitamin C called tetrahexyldecyl ascorbate brightens the overall complexion (e.g. reduces discoloration and evens skin tone) and enhances the appearance of firmness and the overall health of skin. The MAX Stem Cell Crème is also chock-full of ingredients that proactively flood the skin with nourishment. The glycine soja protein is especially important, as it improves the visible signs of tautness, while simultaneously reducing signs of irritation. Centella asiatica and Echinacea extracts also reduce the signs of irritation while making the skin look taut. Yvette: collagen helps your skin maintain its elasticity. Grape seed extract helps moisturize and nourish thanks in part to high levels of linoleic acid, which is an omega-6 fatty acid that moisturizes, but also happens to be light and non-comedogenic so you don’t have to worry about breakouts. Finally, the MAX Stem Cell Crème contains a marine-based ingredient called macrocystic pyrifera extract that evens out skin tone and makes it appear more tight. With its emphasis on rejuvenating the look of collagen-depleted skin, the MAX Stem Cell Crème is one intensely effective product in the fight against deep wrinkles. Used regularly it can help reduce the appearance of wrinkles to reveal smoother and younger-looking skin. All of the aforementioned breakthrough ingredients are made even more potent thanks to the Vectorize Technology™ delivery method, which creates a dramatic, long-lasting effect that will revolutionize your skin. Great article on reducing deep wrinkles. The Max Stem cell creme has all the ingredients to fight wrinkles. Peptides are very effective in wrinkle reduction. Very informative article that will help a lot of people look younger. Nice article on deep wrinkles. Vectorize Technology is a great system for eliminating wrinkles. I agree that the use of peptides will rejuvenate your skin. This product has some proven ingredients to get rid of your wrinkles. Very informative blog, for older persons this product is very helpful in getting younger smoother looking skin.